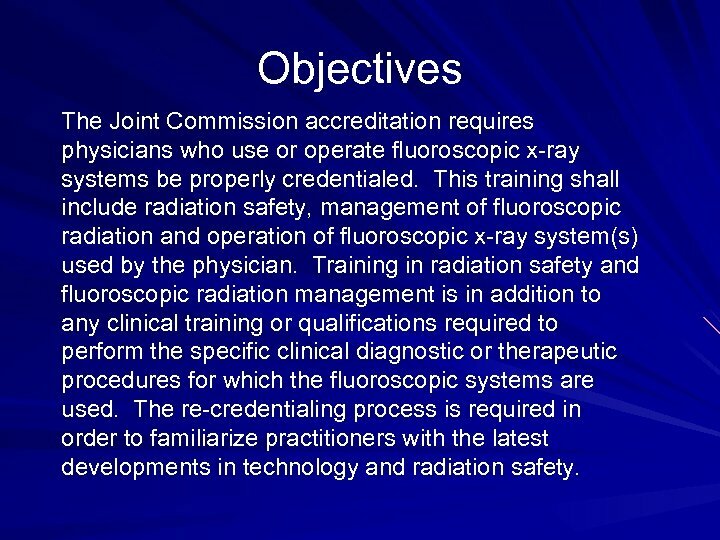 Objectives The Joint Commission accreditation requires physicians who use or operate fluoroscopic x-ray systems be properly credentialed. This training shall include radiation safety, management of fluoroscopic radiation and operation of fluoroscopic x-ray system(s) used by the physician. Training in radiation safety and fluoroscopic radiation management is in addition to any clinical training or qualifications required to perform the specific clinical diagnostic or therapeutic procedures for which the fluoroscopic systems are used. The re-credentialing process is required in order to familiarize practitioners with the latest developments in technology and radiation safety. 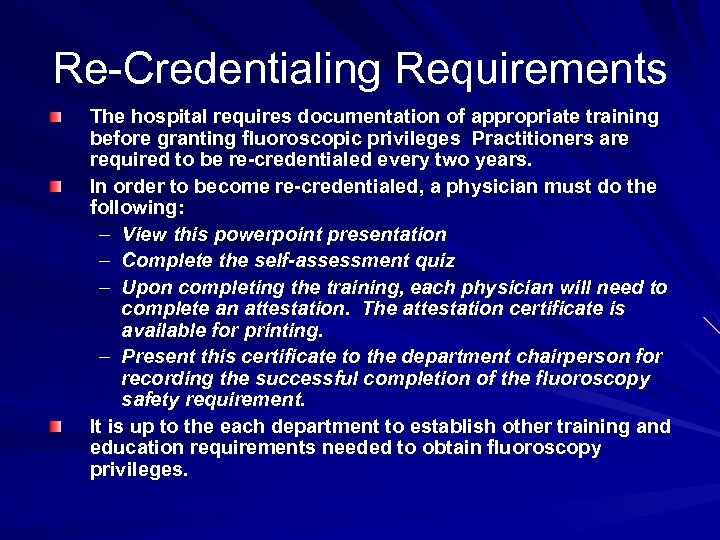 Re-Credentialing Requirements The hospital requires documentation of appropriate training before granting fluoroscopic privileges Practitioners are required to be re-credentialed every two years. In order to become re-credentialed, a physician must do the following: – View this powerpoint presentation – Complete the self-assessment quiz – Upon completing the training, each physician will need to complete an attestation. The attestation certificate is available for printing. – Present this certificate to the department chairperson for recording the successful completion of the fluoroscopy safety requirement. It is up to the each department to establish other training and education requirements needed to obtain fluoroscopy privileges. 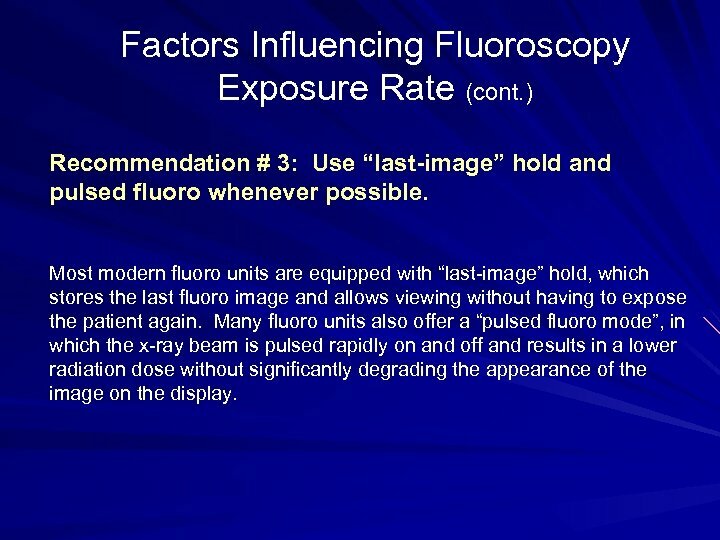 Factors Influencing Fluoroscopy Exposure Rate Modern fluoroscopy units produce images with an image intensifier (II) which brightens the image level sufficiently so that the image may be displayed on a TV screen. Fluoroscopy units are usually operated in an automatic brightness control (ABC) mode. These units will automatically adjust the brightness by first increasing the k. Vp to increase x-ray penetration and then adjusts the m. A to increase intensity. Note: Exposure to a thick patient will be greater than to a thin patient and also abdominal fluoro will require a greater exposure than a chest fluoro due to increased thickness and tissue density in the abdomen. 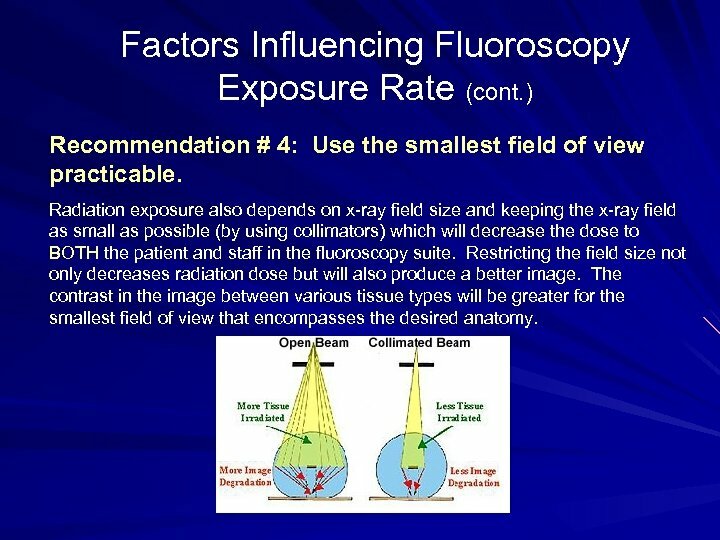 Factors Influencing Fluoroscopy Exposure Rate (cont. ) Recommendation # 1: The image intensifier input should be positioned as close to the patient as practicable. This results in a lower patient dose and sharper image. 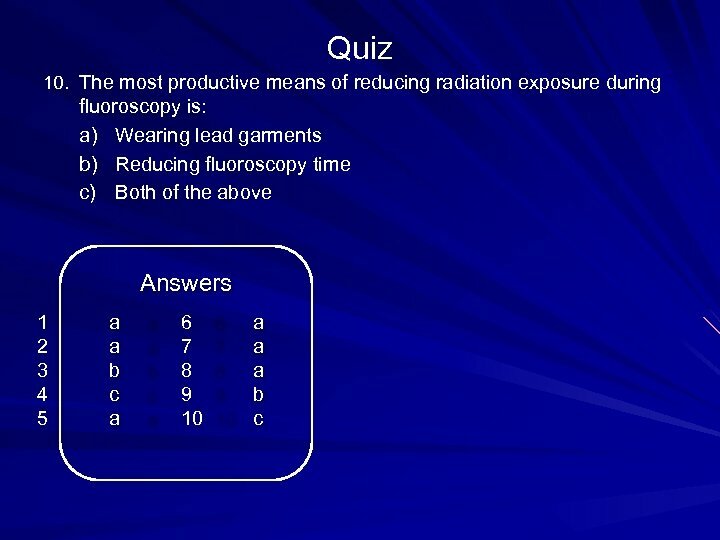 Factors Influencing Fluoroscopy Exposure Rate (cont. ) Recommendation # 2: Use the exposure pedal as sparingly as possible. 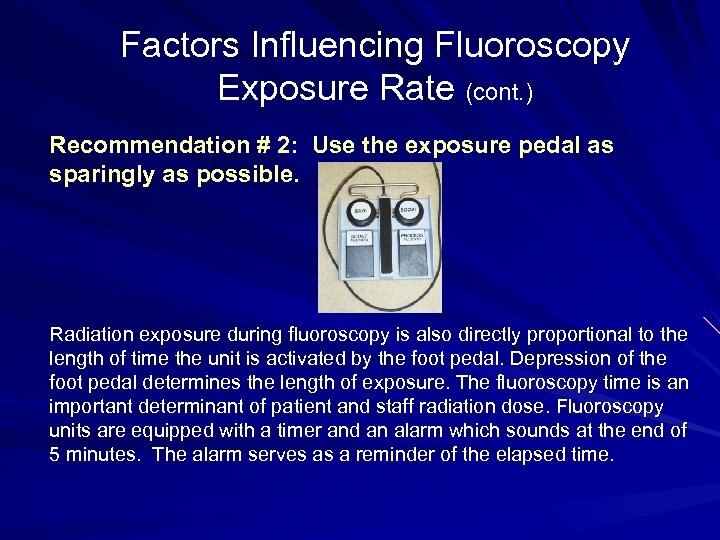 Radiation exposure during fluoroscopy is also directly proportional to the length of time the unit is activated by the foot pedal. Depression of the foot pedal determines the length of exposure. 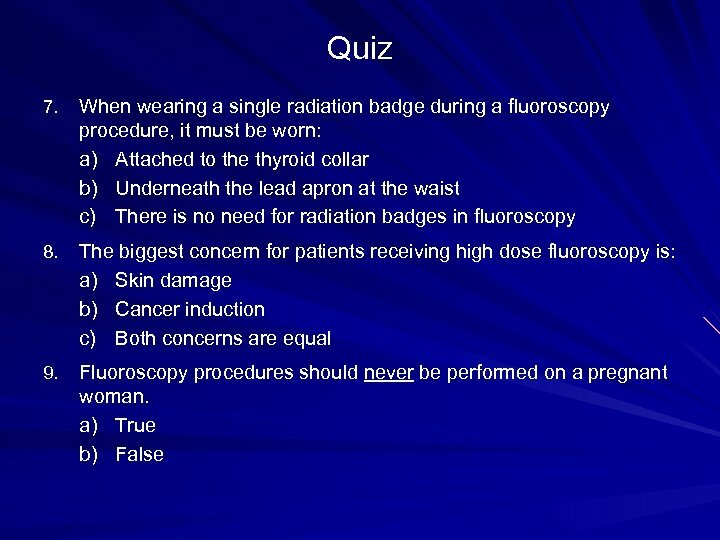 The fluoroscopy time is an important determinant of patient and staff radiation dose. Fluoroscopy units are equipped with a timer and an alarm which sounds at the end of 5 minutes. The alarm serves as a reminder of the elapsed time. 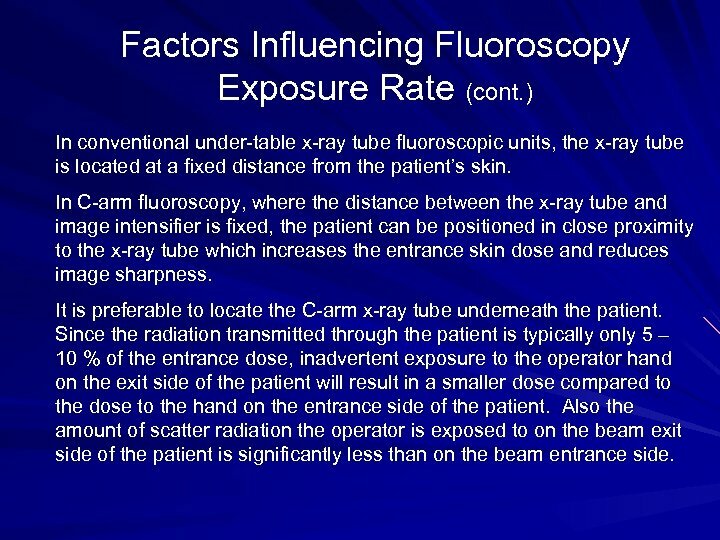 Factors Influencing Fluoroscopy Exposure Rate (cont. ) Recommendation # 3: Use “last-image” hold and pulsed fluoro whenever possible. Most modern fluoro units are equipped with “last-image” hold, which stores the last fluoro image and allows viewing without having to expose the patient again. 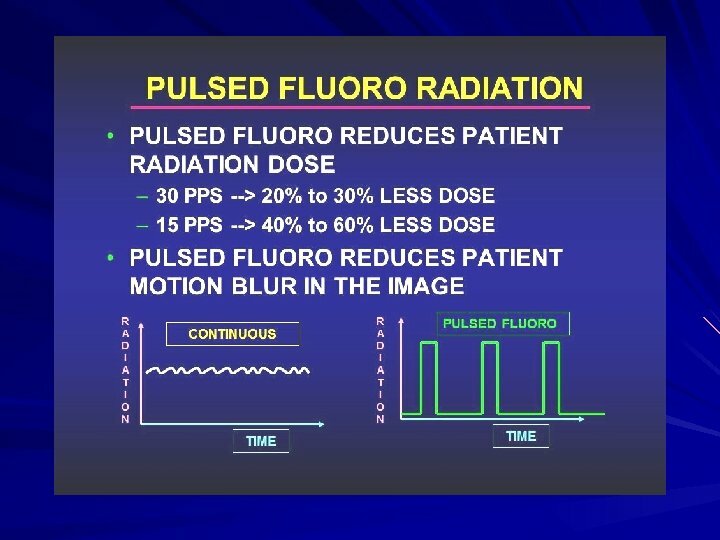 Many fluoro units also offer a “pulsed fluoro mode”, in which the x-ray beam is pulsed rapidly on and off and results in a lower radiation dose without significantly degrading the appearance of the image on the display. 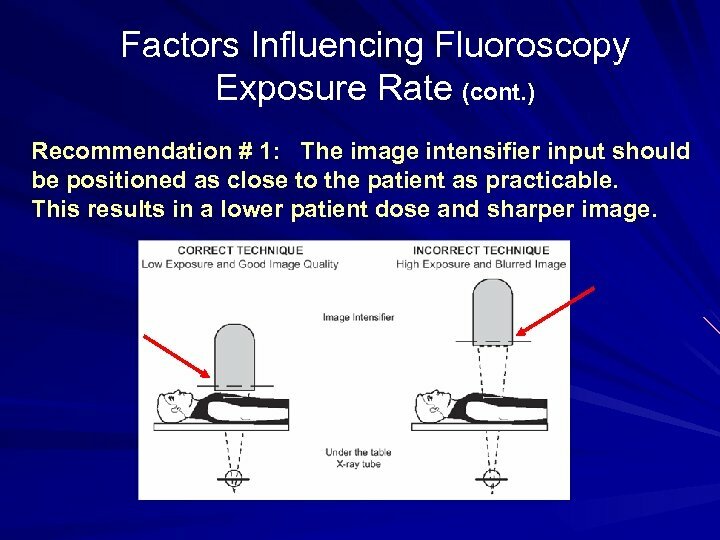 Factors Influencing Fluoroscopy Exposure Rate (cont. ) Recommendation # 4: Use the smallest field of view practicable. 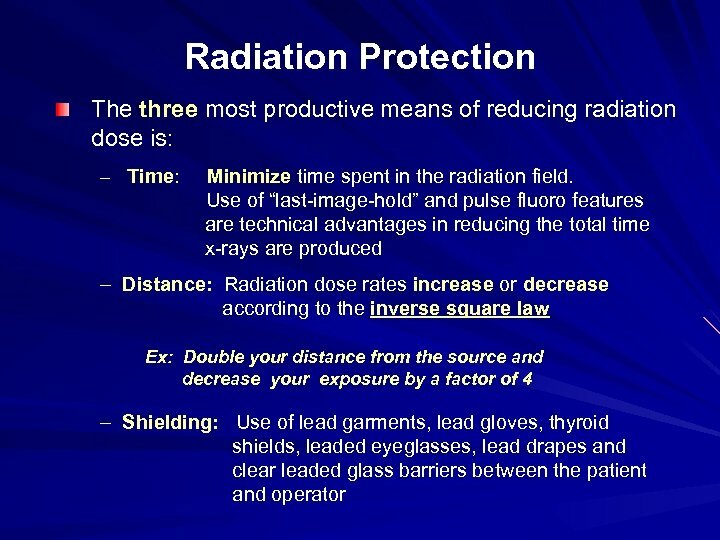 Radiation exposure also depends on x-ray field size and keeping the x-ray field as small as possible (by using collimators) which will decrease the dose to BOTH the patient and staff in the fluoroscopy suite. 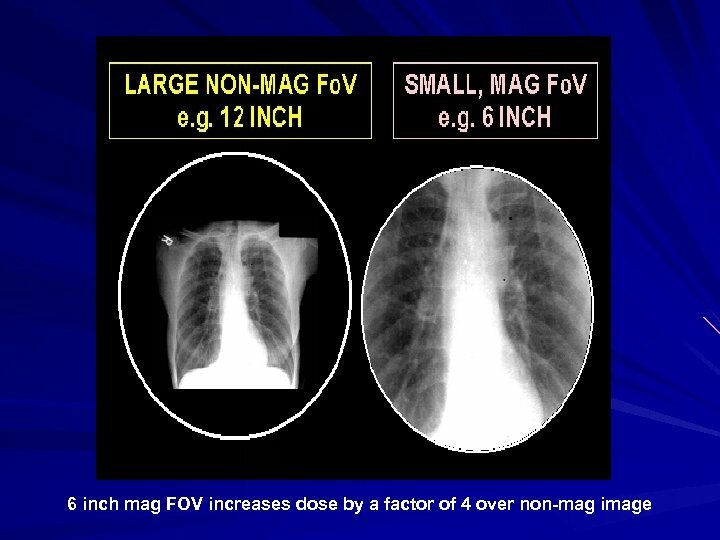 Restricting the field size not only decreases radiation dose but will also produce a better image. The contrast in the image between various tissue types will be greater for the smallest field of view that encompasses the desired anatomy. 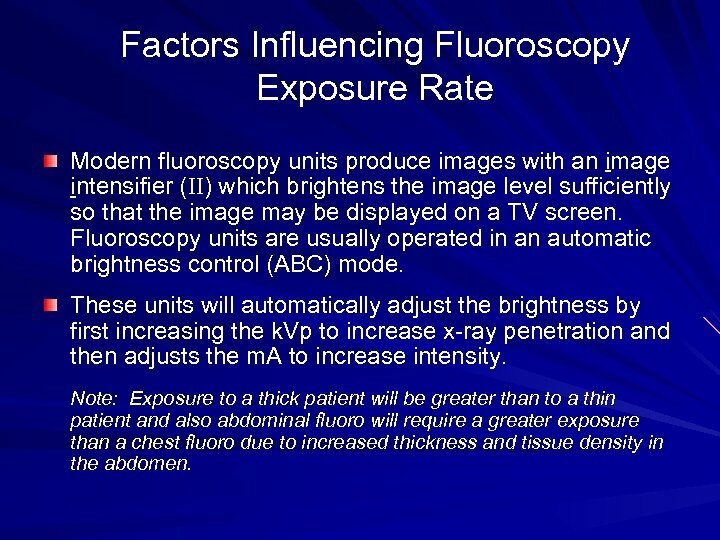 Factors Influencing Fluoroscopy Exposure Rate (cont. ) Recommendation # 5: High dose or detail modes should be used only sparingly. Many fluoro units will have various dose modes, such as low dose, medium dose and high dose mode. It is important to recognize that fluoroscopic image quality can be adversely affected by too few x-rays in the image; the image is noisy for low dose. More tissue contrast is produced by the “high dose” mode which will improve the image quality at the expense however of increased patient dose. 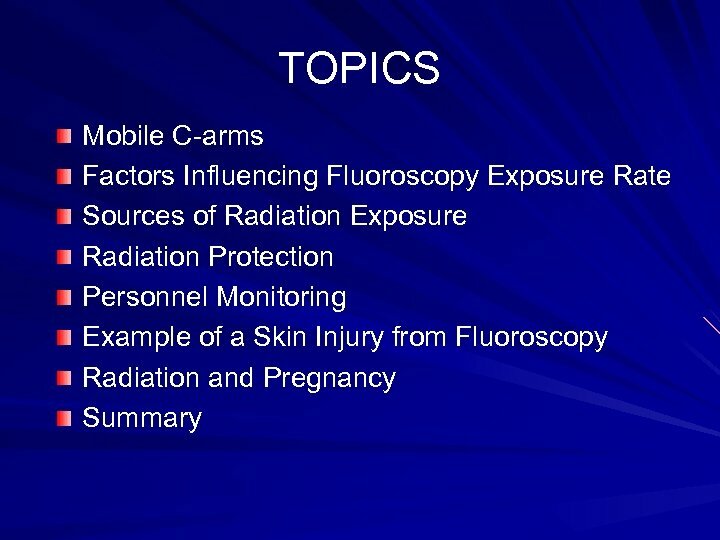 Factors Influencing Fluoroscopy Exposure Rate (cont. ) Recommendation # 6: Magnification should be used only when necessary. 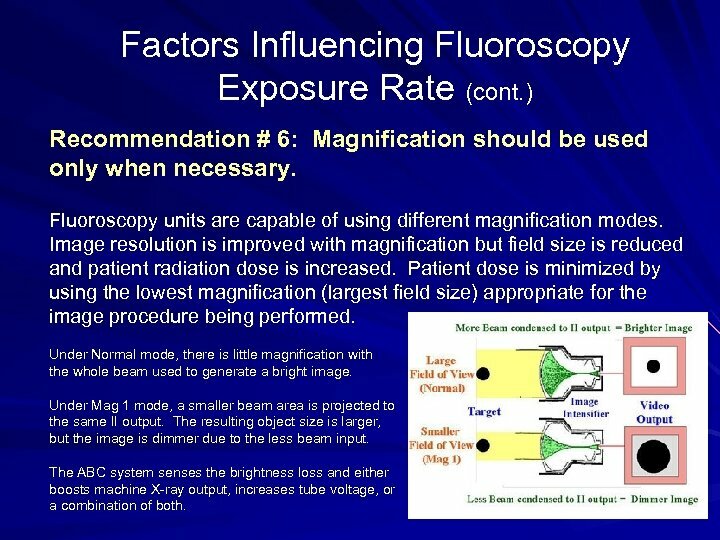 Fluoroscopy units are capable of using different magnification modes. Image resolution is improved with magnification but field size is reduced and patient radiation dose is increased. Patient dose is minimized by using the lowest magnification (largest field size) appropriate for the image procedure being performed. Under Normal mode, there is little magnification with the whole beam used to generate a bright image. 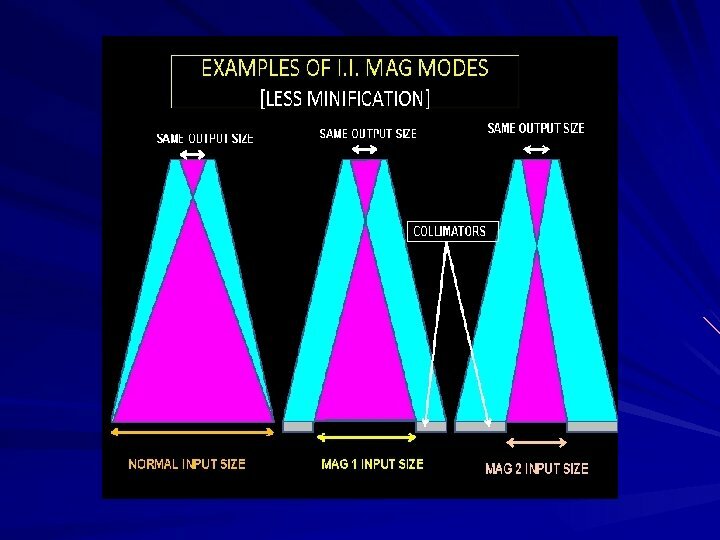 Under Mag 1 mode, a smaller beam area is projected to the same II output. The resulting object size is larger, but the image is dimmer due to the less beam input. The ABC system senses the brightness loss and either boosts machine X-ray output, increases tube voltage, or a combination of both. 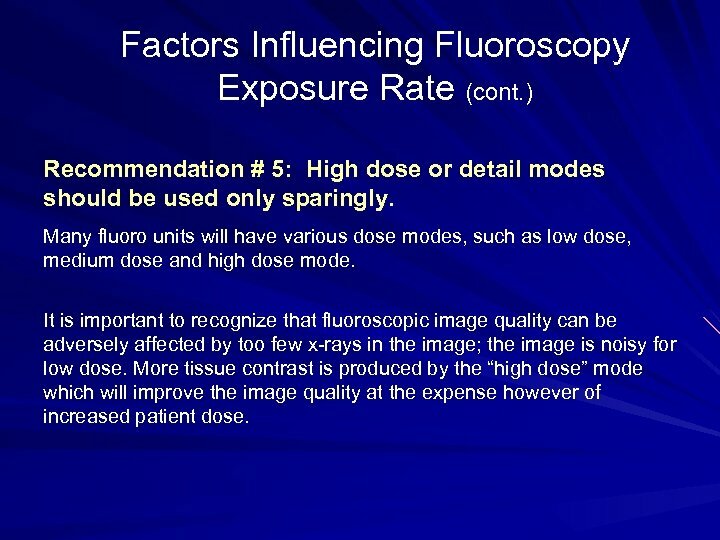 Factors Influencing Fluoroscopy Exposure Rate (cont. ) 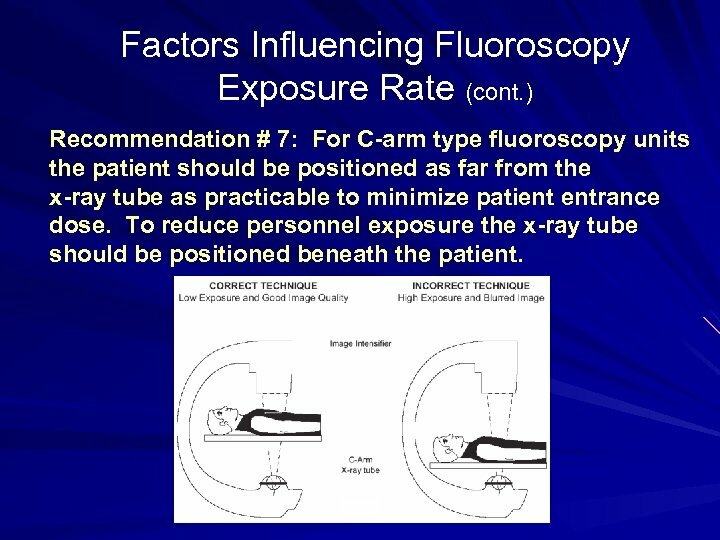 Recommendation # 7: For C-arm type fluoroscopy units the patient should be positioned as far from the x-ray tube as practicable to minimize patient entrance dose. To reduce personnel exposure the x-ray tube should be positioned beneath the patient. In the case of portable C-Arm systems, eliminating the air gap between the I-I and the patient ensures that the table top is as far away as possible from the X-ray tube, minimizing radiation exposure to the patient’s skin. 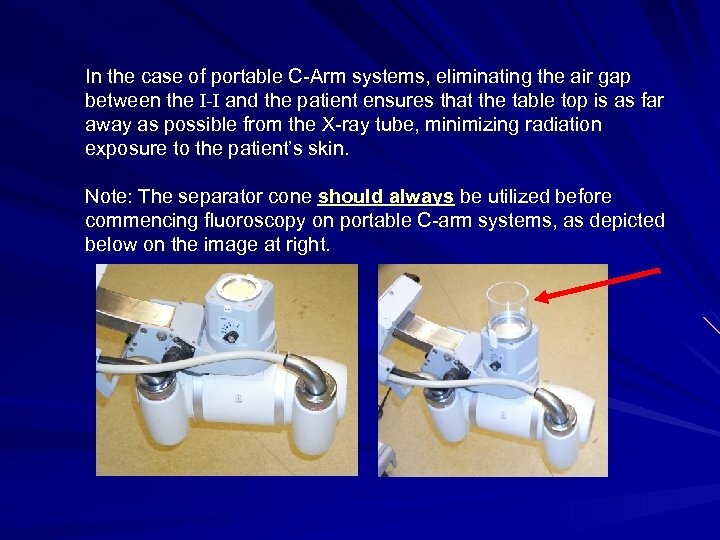 Note: The separator cone should always be utilized before commencing fluoroscopy on portable C-arm systems, as depicted below on the image at right. 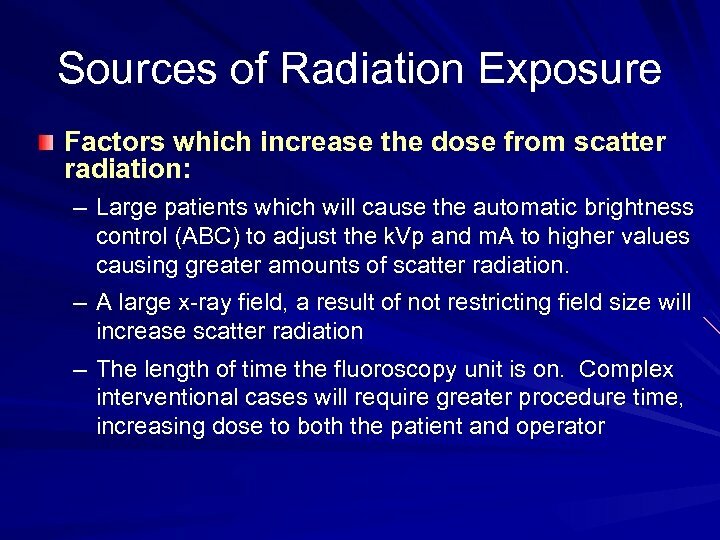 Factors Influencing Fluoroscopy Exposure Rate (cont. ) In conventional under-table x-ray tube fluoroscopic units, the x-ray tube is located at a fixed distance from the patient’s skin. In C-arm fluoroscopy, where the distance between the x-ray tube and image intensifier is fixed, the patient can be positioned in close proximity to the x-ray tube which increases the entrance skin dose and reduces image sharpness. It is preferable to locate the C-arm x-ray tube underneath the patient. Since the radiation transmitted through the patient is typically only 5 – 10 % of the entrance dose, inadvertent exposure to the operator hand on the exit side of the patient will result in a smaller dose compared to the dose to the hand on the entrance side of the patient. 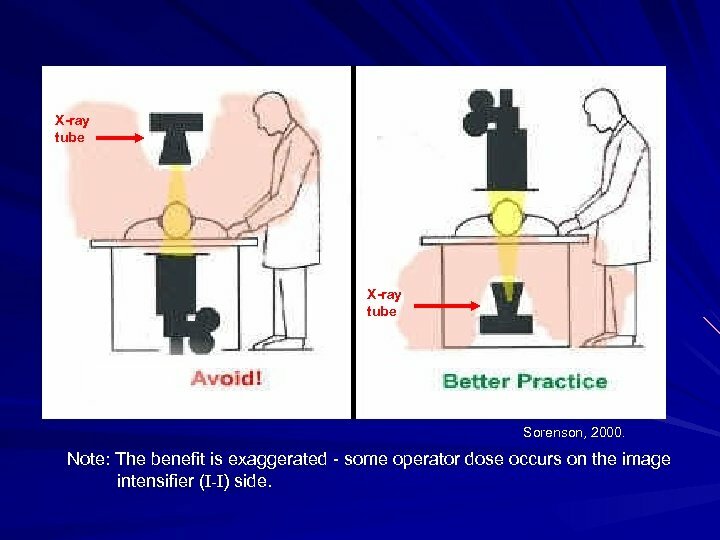 Also the amount of scatter radiation the operator is exposed to on the beam exit side of the patient is significantly less than on the beam entrance side. X-ray tube Sorenson, 2000. Note: The benefit is exaggerated - some operator dose occurs on the image intensifier (I-I) side. 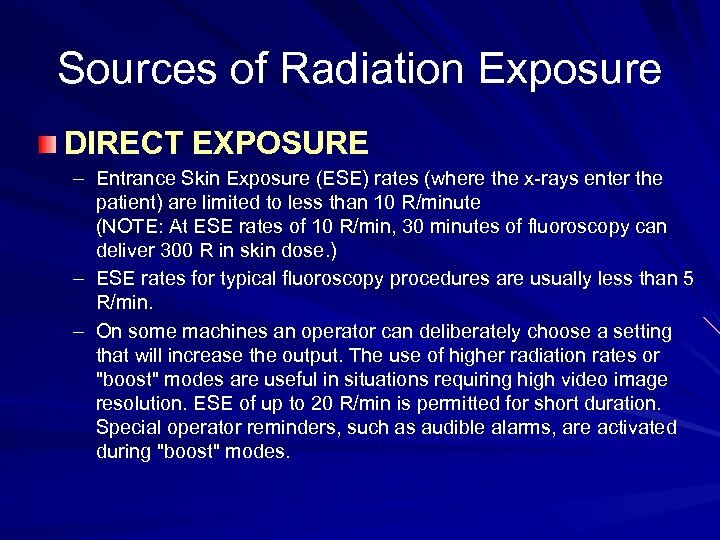 Sources of Radiation Exposure DIRECT EXPOSURE – Entrance Skin Exposure (ESE) rates (where the x-rays enter the patient) are limited to less than 10 R/minute (NOTE: At ESE rates of 10 R/min, 30 minutes of fluoroscopy can deliver 300 R in skin dose. ) 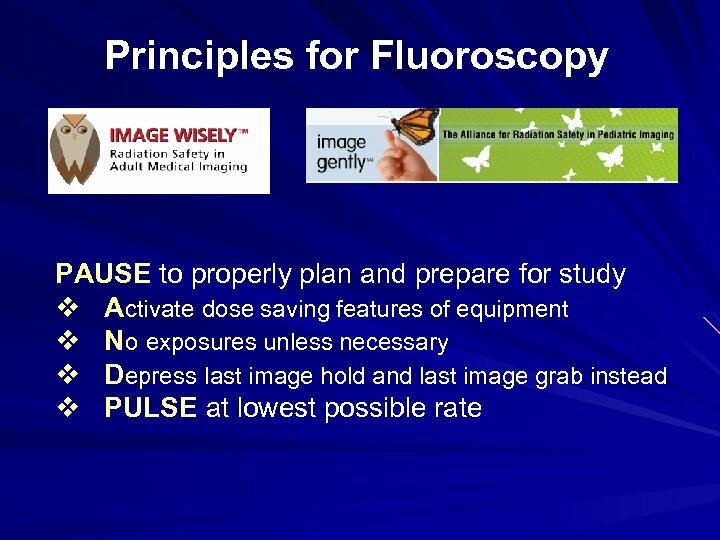 – ESE rates for typical fluoroscopy procedures are usually less than 5 R/min. – On some machines an operator can deliberately choose a setting that will increase the output. The use of higher radiation rates or "boost" modes are useful in situations requiring high video image resolution. ESE of up to 20 R/min is permitted for short duration. Special operator reminders, such as audible alarms, are activated during "boost" modes. 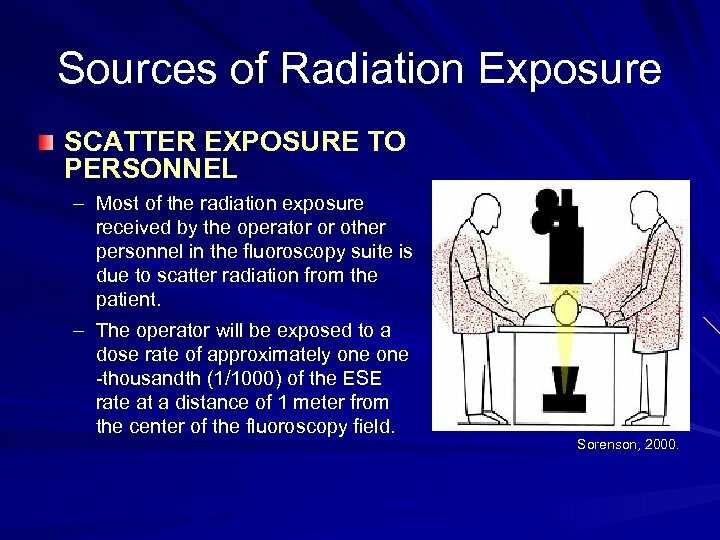 Sources of Radiation Exposure SCATTER EXPOSURE TO PERSONNEL – Most of the radiation exposure received by the operator or other personnel in the fluoroscopy suite is due to scatter radiation from the patient. – The operator will be exposed to a dose rate of approximately one -thousandth (1/1000) of the ESE rate at a distance of 1 meter from the center of the fluoroscopy field. Sorenson, 2000. 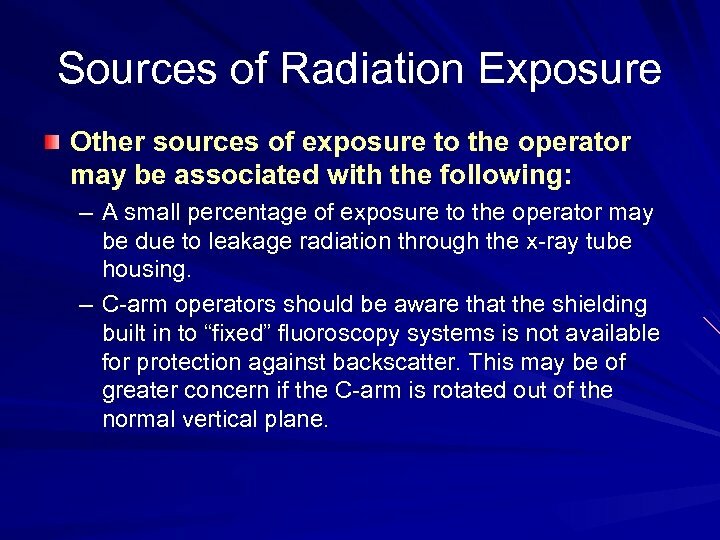 Sources of Radiation Exposure Other sources of exposure to the operator may be associated with the following: – A small percentage of exposure to the operator may be due to leakage radiation through the x-ray tube housing. 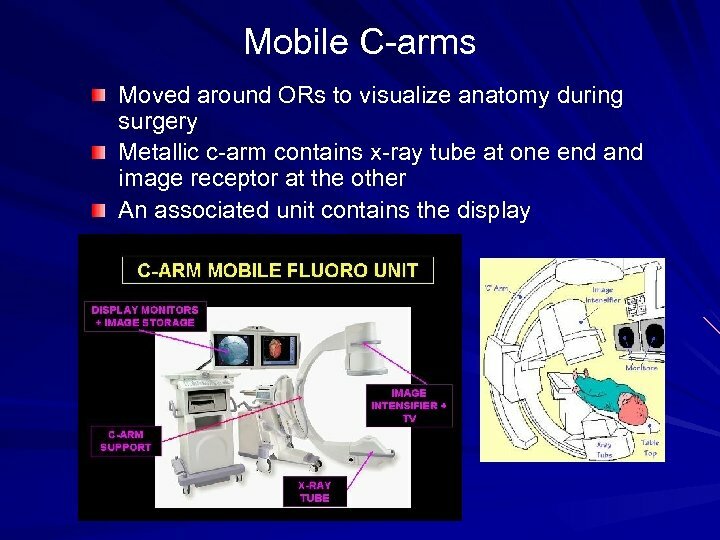 – C-arm operators should be aware that the shielding built in to “fixed” fluoroscopy systems is not available for protection against backscatter. This may be of greater concern if the C-arm is rotated out of the normal vertical plane. 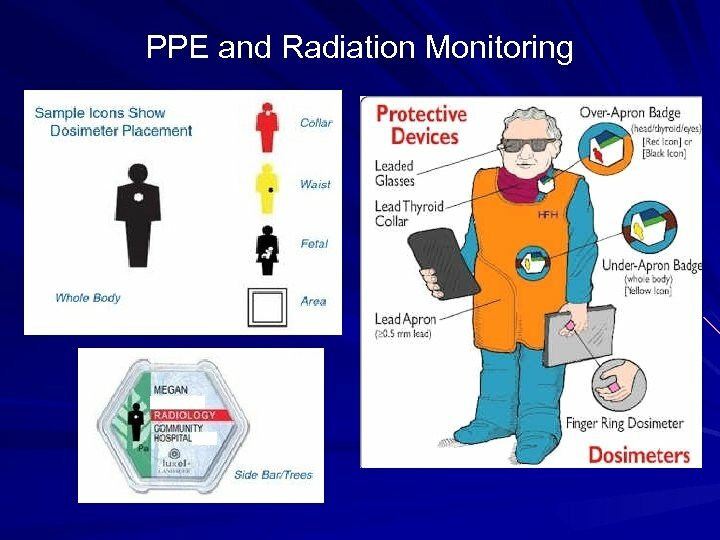 Personnel Monitoring Even when radiation protection techniques and engineering controls are in place to reduce personnel exposure, individual dose monitoring is required. 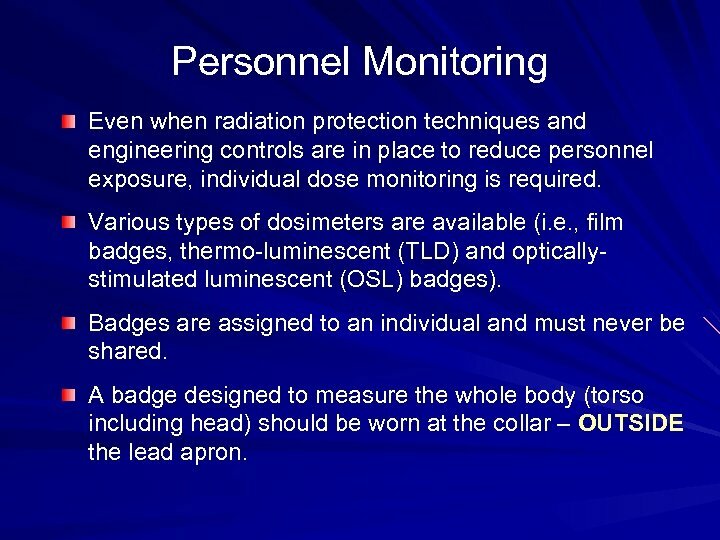 Various types of dosimeters are available (i. e. , film badges, thermo-luminescent (TLD) and opticallystimulated luminescent (OSL) badges). Badges are assigned to an individual and must never be shared. A badge designed to measure the whole body (torso including head) should be worn at the collar – OUTSIDE the lead apron. 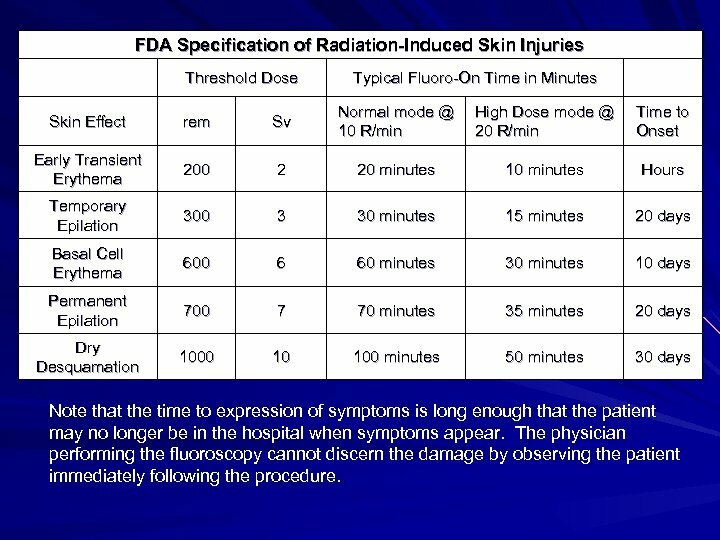 FDA Specification of Radiation-Induced Skin Injuries Threshold Dose Typical Fluoro-On Time in Minutes Normal mode @ High Dose mode @ 10 R/min 20 R/min Time to Onset Skin Effect rem Sv Early Transient Erythema 200 2 20 minutes 10 minutes Hours Temporary Epilation 300 3 30 minutes 15 minutes 20 days Basal Cell Erythema 600 6 60 minutes 30 minutes 10 days Permanent Epilation 700 7 70 minutes 35 minutes 20 days Dry Desquamation 1000 10 100 minutes 50 minutes 30 days Note that the time to expression of symptoms is long enough that the patient may no longer be in the hospital when symptoms appear. The physician performing the fluoroscopy cannot discern the damage by observing the patient immediately following the procedure. 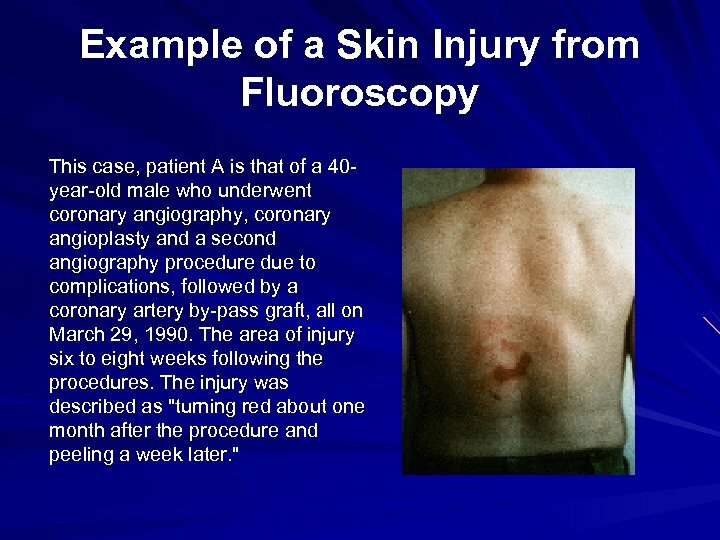 Example of a Skin Injury from Fluoroscopy This case, patient A is that of a 40 year-old male who underwent coronary angiography, coronary angioplasty and a second angiography procedure due to complications, followed by a coronary artery by-pass graft, all on March 29, 1990. The area of injury six to eight weeks following the procedures. The injury was described as "turning red about one month after the procedure and peeling a week later. " 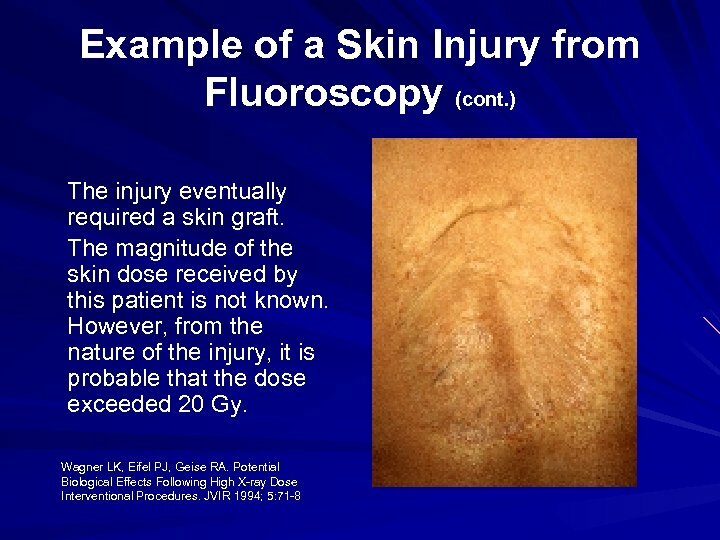 Example of a Skin Injury from Fluoroscopy (cont. ) In mid-May 1990, it had the appearance of a second-degree burn. 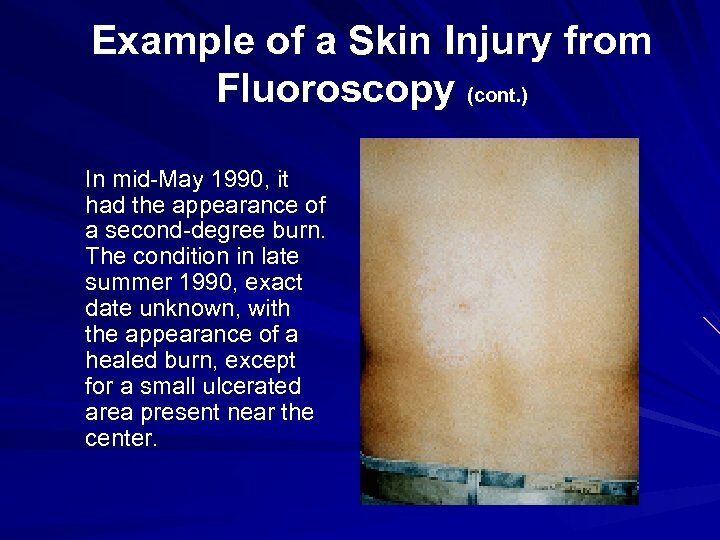 The condition in late summer 1990, exact date unknown, with the appearance of a healed burn, except for a small ulcerated area present near the center. 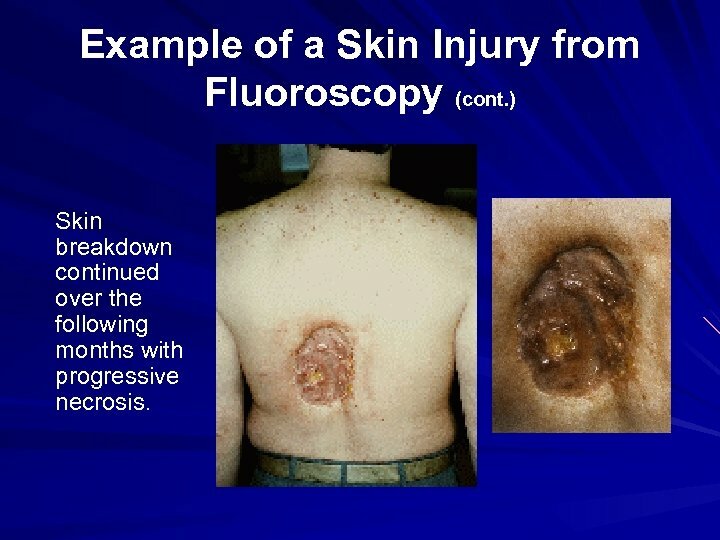 Example of a Skin Injury from Fluoroscopy (cont. ) Skin breakdown continued over the following months with progressive necrosis. 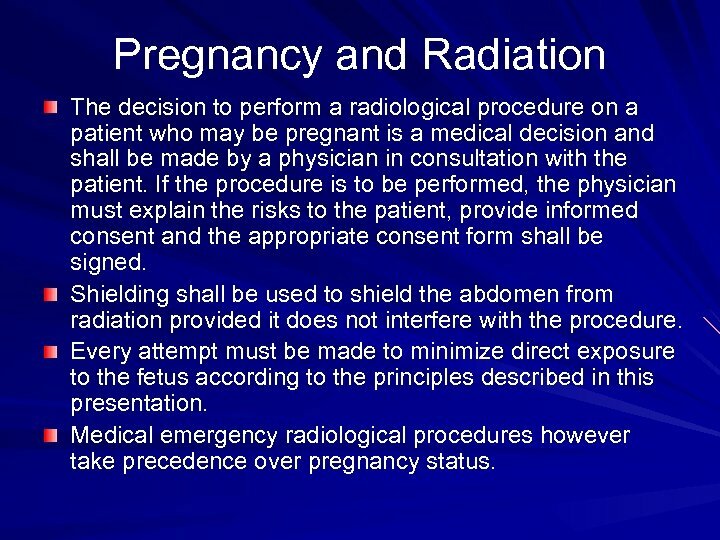 Pregnancy and Radiation The decision to perform a radiological procedure on a patient who may be pregnant is a medical decision and shall be made by a physician in consultation with the patient. If the procedure is to be performed, the physician must explain the risks to the patient, provide informed consent and the appropriate consent form shall be signed. Shielding shall be used to shield the abdomen from radiation provided it does not interfere with the procedure. Every attempt must be made to minimize direct exposure to the fetus according to the principles described in this presentation. Medical emergency radiological procedures however take precedence over pregnancy status. 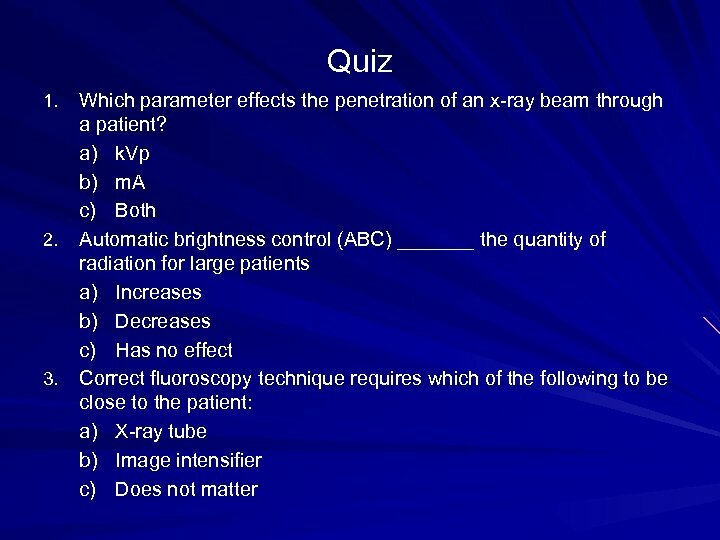 Quiz Which parameter effects the penetration of an x-ray beam through a patient? a) k. Vp b) m. A c) Both 2. Automatic brightness control (ABC) _______ the quantity of radiation for large patients a) Increases b) Decreases c) Has no effect 3. 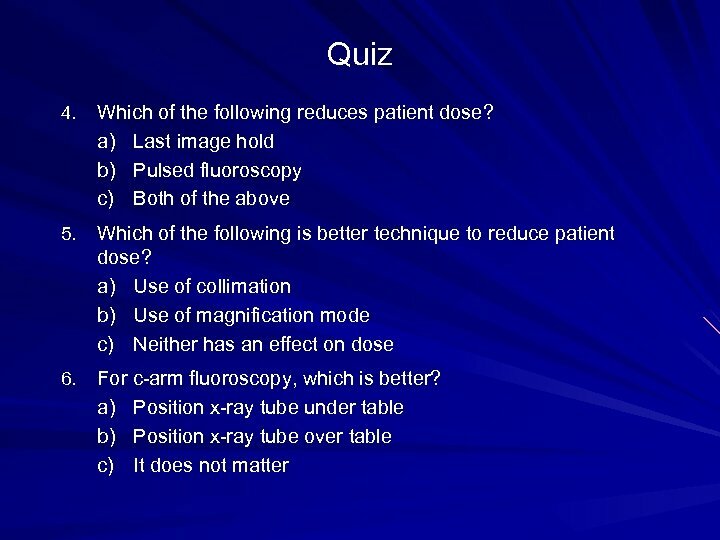 Correct fluoroscopy technique requires which of the following to be close to the patient: a) X-ray tube b) Image intensifier c) Does not matter 1. 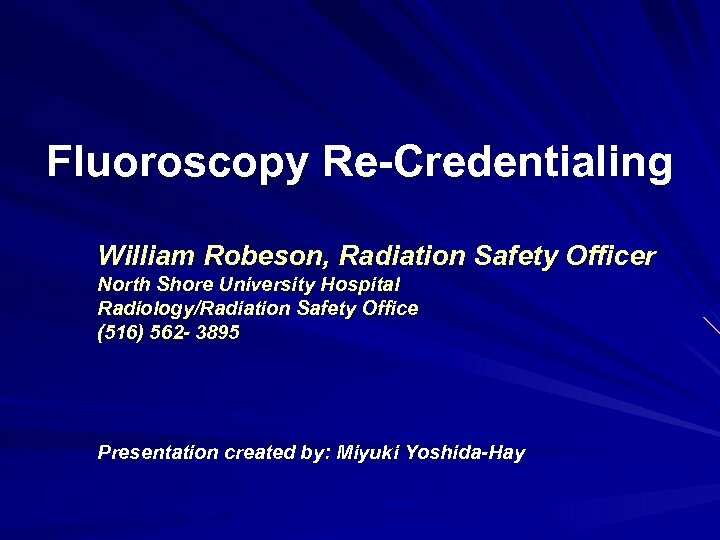 PHYSICIAN ATTESTATION (Fluoroscopy Re-credentialing) I have read the material on radiation safety and fluoroscopy and understand the operation and radiation safety features of the fluoroscopic units that I will use. Print Name _____________ Signature_________________ Date________ Hospital Affiliation: ____________ Dept_________ The information presented in this training document is designed to give a practitioner a basic knowledge of radiation safety principles as they apply to the use of fluoroscopy. The practitioner in addition must have knowledge and experience in the use of the specific radiographic systems that they will perform procedures with. 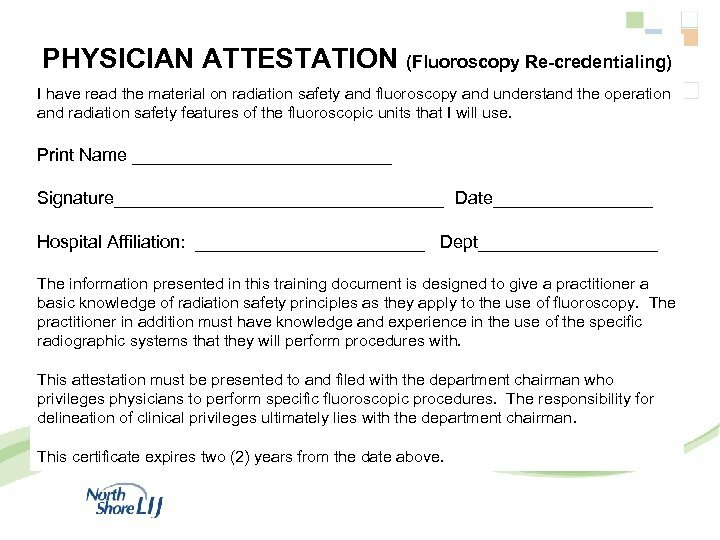 This attestation must be presented to and filed with the department chairman who privileges physicians to perform specific fluoroscopic procedures. The responsibility for delineation of clinical privileges ultimately lies with the department chairman. This certificate expires two (2) years from the date above.